It’s been a while since I read the NASA manual on space helmet operation, but if I recall correctly, they really just have one major rule. When you go to space, keep your space helmet on. I don’t care what haunting music those beguiling space sirens are playing. It doesn’t matter if you’ve got a serious case of space madness, and you’re hallucinating that you’re back on your Iowa farm, surrounded by your loved ones. Even if you just turned on an ancient terraforming machine and you’re stumbling around the surface of Mars like an idiot. You keep your helmet on. Not convinced? Well then, allow me to explain what happens if you decide to break that rule. Without a helmet, and your own personal Earth-like atmosphere surrounding you, you’ll be exposed to the hard vacuum of space. Within a moment, all the air will rush out of your lungs, and then you’ll fall unconscious in about 45 seconds. Starved for oxygen, you’ll die of suffocation in just a couple of minutes. Then you’ll freeze solid and float about forever. Just another meat asteroid in the Solar System. That’s the official stance on space helmet operation, but just between you and me, there might be a little wiggle room. A few other places in the Solar System where you can take your helmet off for just a moment, and maybe not die instantaneously. Earth is obviously safe. If you’re down here on the planet, and you’re still wearing your helmet, you’re missing the whole point of why you need a helmet in the first place. That space helmet rule only applies to space, silly, you can take it off down here. In order to survive, the human body needs a few things. First, we need pressure surrounding our body, and helping to keep our lungs inflated. The Earth’s atmosphere provides that service, stacking a huge column of air down on top of you. Without enough pressure, the air will blast out of your lungs and you’ll suffocate. Too much pressure and your lungs will crush and your heart will give out. You’re going to want atmospheric pressure somewhere between .5 to 5 times the atmosphere of Earth. If you can’t find air, then some other gas or even water will do in a pinch. You can’t breathe it, but it can provide the pressure you’re looking for. If you’ve got the pressure right, then your next priority will be the temperature. You know what it’s like to be too cold on Earth, and too hot, so use your judgement here. It’s too cold if you’re starting to die of hypothermia, and too hot if you’re above 60 C for a few minutes. If you really want to thrive, find air you can breathe. Ideally a nice mixture of nitrogen and oxygen. Again, here on Earth, that column of air pushing down on you also allows you to breathe. If you swapped air for carbon dioxide or water, you’re going to need to hold your breath. So what are some other places in the Solar System that you could take your helmet off for a few brief moments? Your best bet is the planet Venus. Not down at the surface, where the temperature is hot enough to melt lead, and it’s 90 atmospheres pressure. But up in the cloud tops, it’s a whole different story. At 52.5 kilometers altitude, the temperature is about 37 C. A little stifling, but not too bad. And the air pressure is about 65% Earth’s air pressure. The problem is that this region is right in the middle of Venus’ sulphuric acid cloud layer, so you might inhale a mist of toxic acid if you tried to breathe. Not to mention the fact that Venus’ atmosphere is carbon dioxide, which means you’ll asphyxiate if you tried to breathe it. But assuming you had some kind of air supply to breathe, and a suit to protect you from the sulphuric acid, you could hang around, without a helmet as long as you liked. Take that! Overly draconian NASA helmet rules. Out on the surface of Titan? Good news! The surface pressure on Titan is 1.45 times that of Earth. You won’t need a pressure helmet at all, ever. You will need a warming helmet, however, since the temperature on Titan is -179 C. You might be able to take that helmet off for a brief moment, before your face freezes, but don’t take a breath, otherwise you’ll freeze your lungs. Want another location? No problem. Astronomers are pretty sure there are vast reservoirs of water under the surface of many moons and large objects in the Solar System, from Europa to Charon. They’re heated up through tidal interactions, and could be dozens of kilometers thick. Drill down through the ice sheet, and then just dive into the icy waters without a helmet. It’ll be really cold, and you won’t be able to breathe, but you can stay alive as long as you can hold your breath. Did you jump out of your spacecraft and now you’re falling to your death into one of the Solar System’s gas giants? That’s bad news and it won’t end well. However, there’s a tiny silver lining. 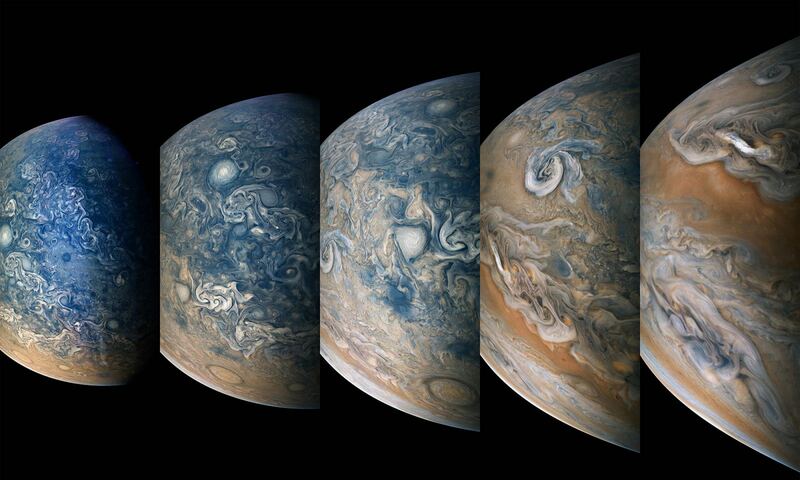 As you fall through the atmosphere of Jupiter, for example, there’ll be a moment when the temperature and pressure roughly match what your body can handle. Go ahead and take your helmet off and enjoy that sweet spot before you plunge into the swirling hydrogen gas. Once again, though, don’t breathe. Hold your breath, the moment will last longer before you go unconscious. And listen, if you really really need to take off your helmet in the cold vacuum of space, you can do it. Make sure you completely exhale so you don’t wreck your lungs. Then you’ve got about 45 seconds before you go unconscious. That’s enough time to jump across to an open airlock, or kick that nasty xenomorph holding onto your leg into deep space. Even though the NASA space helmet manual has one rule – keep your helmet on – you can see there are a few times and places where you can bend those rules without instantly dying. Use your judgement. I’d like to thank Mechadense for posting a comment on an earlier Guide to Space YouTube video, which became the inspiration for this episode. Thanks for doing the math Mechadense and bringing the science. But when it comes down to it, Zero Gravity Day is just a lot of warmed-over hoo-ha. Let’s sort out what’s fact and what’s fancy in this claim. Sir Patrick Moore, one of the world’s greatest astronomy popularizers. He wrote more than 70 books and was the host of the long-running BBC TV series “The Sky at Night”. True: Patrick Moore did make this claim in a BBC radio program on April 1, 1976 … as an April Fools Day joke! The article doesn’t bother to mention this significant detail. Ever so sly, Moore fibbed about the details of the purported alignment. Pluto was in Virgo and Jupiter in Pisces on that date, exactly opposite one another in the sky and as far out of alignment as possible. Gullible to suggestion, hundreds of listeners phoned in to the BBC saying they’d experienced the decrease in gravity. One woman said she and 11 friends had been “wafted from their chairs and orbited gently around the room”. Martin Wainwright, who edited the book The Guardian Book of April Fool’s Day (published by the British newspaper The Guardian), described Moore as the ideal presenter with his “weight delivery” lending an added “air of batty enthusiasm that only added to his credibility”. The Daily Buzz updated the joke and gave it even more credibility by wrapping it up in “bacon” — a fake NASA tweet. False: Jupiter and Pluto will not be in alignment on January 4th. Pluto is hidden the solar glare in Sagittarius at the moment, while Jupiter shines nearly halfway across the zodiac in Leo. Far, far apart. False: Planetary alignments will not make you weightless. Not even if all the planets and Sun aligned simultaneously. While the gravity of a place is Jupiter is HUGE and will crush you if you could find a surface to stand on, the distance between Earth and Jupiter (and all the other planets for that matter) is enormous. This waters down gravity in a big way. Jupiter tugs on you personally with the same gravitational force as a compact car three feet (1-meter) away. As for Pluto, it’s almost 60 times smaller than Jupiter with a gravitational reach that can only be described as virtually ZERO. The Sun also has a significant gravitational effect on Earth, but when was the last time you heard of people floating in the air during a total solar eclipse? If our strongest gravitational neighbors can’t loft you off your feet then don’t look to Jupiter and Pluto. Not that I wish this wouldn’t happen as it would provide a fitting physical aspect to what for many is a spiritual phenomenon. There are countless claims on the Internet that alignments of comets, planets and fill-in-the-blanks produce earthquakes, deadly meteor storms, bad juju and even endless hiccups. It’s all pseudoscientific hogwash. Either deliberately made up by to lead you astray or because someone hasn’t checked the facts and simply passes on what they’ve heard. The stuff spreads like a virus, wasting our time and bandwidth and distracting our attention from the real beauty and bizarreness of the cosmos. How to stop it? Critical thinking. If this skill were at the top of the list of subjects taught in high school, we’d live on a very different planet. Maybe I’m dreaming. Maybe we’ll always be gullible to snake-oil claims. But I’d like to believe that a basic knowledge of science coupled with the ability to analyze a claim with a critical eye will go a long way toward extinguishing bogus scientific claims before they spread like wildfire. Come this Sunday at 9:47 a.m. PST allow me to suggest that instead of waiting to float off the ground, tell your family and friends about the amazing Full Wolf Moon that will shine down that evening from the constellation Gemini. If it’s magic you’re looking for, a a walk in winter moonlight might do the trick. Orbiting 200 miles above the Earth, Retired Astronaut Chris Hadfield could easily photograph the ridges of the Himalayan Mountains, the textures of the Sahara Desert and the shadows cast by the tallest buildings in Manhattan. Although Hadfield has already shared many of his photos via social media, he unveiled another 150 images in his latest book, “You Are Here: Around The World in 92 Minutes.” The photographs open a rare window onto the Earth, illuminating our planet’s beauty and the consequences of human settlement. The book is designed to replicate a single 92-minute orbit aboard the International Space Station. “It’s as if you and I are sitting at the window of the space station, and I said, ‘let’s go around the world once. I want to show you the really cool stuff,’ ” said Hadfield. The astronaut, famed for his zero-gravity rendition of David Bowie’s “Space Oddity,” took approximately 45,000 photos during his 146-day stint on the space station in 2013. That’s roughly 300 photos per day every day. Since NASA does not set aside specific time slots for astronauts to take photos, Hadfield did so while he should have been asleep or serenading millions with his guitar. Why? Beauty triggers an unexplained emotional reaction, explained Hadfield. It also provides the best means of communication. Although the space station is an incredible scientific laboratory, art is equally important, he added, because it’s a way to reach people who might not otherwise be interested in the scientific nitty-gritty. Hadfield is often attributed for humanizing space travel in a way that others before him had not. His use of social media, videos designed to quench our curiosity about living in space, and music, demonstrate a sheer passion that has inspired millions. His photos not only share the natural beauty of our home planet, but also many signs of humanity, from bright city lights to the devastations of climate change as lakes dry up and disappear. “There’s so much information in just one glimpse out the window of human decision making and geology,” said Hadfield. Talk about a high-flying career! Being a government astronaut means you have the chance to go into space and take part in some neat projects — such as going on spacewalks, moving robotic arms and doing science that researches the nature of the human body. Behind the glamor and the giddiness of flight, however, astronauts also need to pay their bills on Earth. How much you get paid as an astronaut depends on what agency you work for – as well as your experience, just like any other career. The information below for NASA, the European Space Agency (ESA) and the Canadian Space Agency (CSA) is current as of April 2014, unless otherwise noted. Three agencies do not disclose salary scales online, at least in English pages: the Japan Aerospace Exploration Agency (JAXA), the Russian Federal Space Agency (Roscosmos) and the China National Space Administration (CNSA). NASA has 43 active astronauts and eight astronauts-in-training who were selected in 2013. Until basic training is completed, which takes about two years, selectees are called “astronaut candidates”. (Astronauts from other agencies, such as ESA and CSA, often join NASA selectees for basic training.) Then even after they’re selected, it could be years more before they take a spaceflight. Some astronauts are hired as civilian employees while others come over from the military. Civilian astronauts are paid according to a government scale that ranges from classifications GS-11 to GS-14. In 2012, employees living in Houston (where astronaut training facilities are located) make a minimum of $64,724 for a GS-11 to a maximum of $141,715 for a GS-14. As employees pick up more qualifications, responsibility and experience, their salaries increase. ESA’s most recent astronaut class was selected in 2009. They have all either flown in space, or have been assigned to future missions aboard the International Space Station. Astronauts are paid between the A2 and A4 scales set by the Coordinated Organisations, a group of European intergovernmental groups. “Upon entering the ESA Astronaut Corps, new recruits will generally be paid at the A2 level. Following the successful completion of the basic astronaut training, the recruit will be paid in accordance with the grade A3. The promotion to the grade A4 generally follows after the first spaceflight,” the European Space Agency stated. Canada has two active astronauts, neither of which have been assigned to a spaceflight yet. The CSA does not disclose on its website how much astronauts make, but some information is available on the website of the Privy Council Office – an advisory group to Canada’s prime minister and senior officials. Documents indicate civilian astronauts are paid according to an Astronaut Salary Scale, ranging from Grade 1 to Grade 3. As of 2011, astronauts are paid a minimum of $89,100 Canadian ($80,897) in Grade 1 and a maximum of $174,000 Canadian ($158,470) in Grade 3. Newly minted astronaut candidates appear to move to Level 2 upon completing basic astronaut training, which takes two years, and then increase their salary with more experience. Military astronauts are paid according to a separate scale that was not disclosed in PCO documents. Generally, you must be the citizen of a particular country with a space program to apply as an astronaut. U.S. astronauts are U.S. citizens, European astronauts are citizens of European countries, and so forth. Each space agency has periodic astronaut selections where they put out a call for candidates and then winnow down the list to a handful of people selected for astronaut training. The United States had its last selection in 2013, and ESA, CSA and JAXA did theirs in 2009. While space agencies are careful not to specify certain kinds of degrees or universities for applicants, generally speaking astronauts have technical, medical or military backgrounds. Astronauts are best known by the public for their time in space, but in reality they will spend most of their careers on the ground. International Space Station astronauts are expected to be proficient in station systems, science and spacewalks. They also must learn how to operate the Soyuz spacecraft that gets them into space, and to learn Russian since that country is a major partner of the International Space Station. When astronauts aren’t training, they’re working to support other missions — sometimes in locations such as NASA’s Mission Control or in pools used for spacewalk training. They additionally spend hours of time doing outreach for schools and other audiences, and travelling all over the world to the various training centers used to get people ready for spaceflight. It’s a tough career, but those who make the trek into space say the view is totally worth it. The following pages give you more information on becoming an astronaut, and what to expect once you get selected. See this and more videos from Conan on the TeamCoco YouTube page. A fire breaks out on the International Space Station while the orbiting complex is over Russian mission control. How, as an English-speaking astronaut, would you keep up with instructions? The answer is years of Russian training. In between time in simulators, jet airplanes and underwater, neophyte astronauts spend hours learning to read Cyrillic characters and pronounce consonant-heavy words. In fact, one of NASA’s requirements for its astronauts now is to learn the Russian language. Saint-Jacques himself is no neophyte to language learning. A native francophone, he learned English in public school and really improved it when he was 15 and moved with his family to England for a year. Today he speaks it fluently. He also has some abilities in Japanese, a language he picked up while in that country for a junior academic position at a university. Now approaching four years as an astronaut trainee, Saint-Jacques told us how astronauts learn Russian. It’s a process that not only includes classroom instruction, but time living with a family in Moscow to really pick up on colloquialisms. Below is an edited interview. Stranded on an alien planet, ejected from your burning ship and with only minutes of breathable air left, your chances of survival look slim indeed. And with — something — tearing holes in your suit, you’ll likely be dead before you know it. That is, of course, unless you have a good narrator. “Voice Over,” a short film directed by Martin Rosete, puts you in this and a couple other similarly precarious situations, each seemingly bleaker than the last. Through it all a narration by Feodor Atkine underscores the hopelessness (in French, with subtitles) until the final reveal, which… well, I won’t spoil it for you. All I’ll say is it’s well worth 9 minutes of your time. I must say, I couldn’t help but feel like I was watching a film version of a Choose Your Own Adventure book. You’ve probably seen plenty of photos of astronauts and cosmonauts working aboard the International Space Station, and maybe even some videos of ISS briefings and interviews and tours throughout the different modules (and perhaps even an astronaut-produced song or two.) But have you ever wondered what the average, everyday sounds inside Station are like? If so, Canadian astronaut and Expedition 34 flight engineer Chris Hadfield has an earful for you. Listen to more sounds of the Station on Chris Hadfield’s Soundcloud page here. Inset image: Chris Hadfield poses with a Materials Science Laboratory Furnace Launch Support Structure (FLSS) in the Destiny laboratory of the International Space Station. NASA astronaut Tom Marshburn, flight engineer, uses a computer in the background. 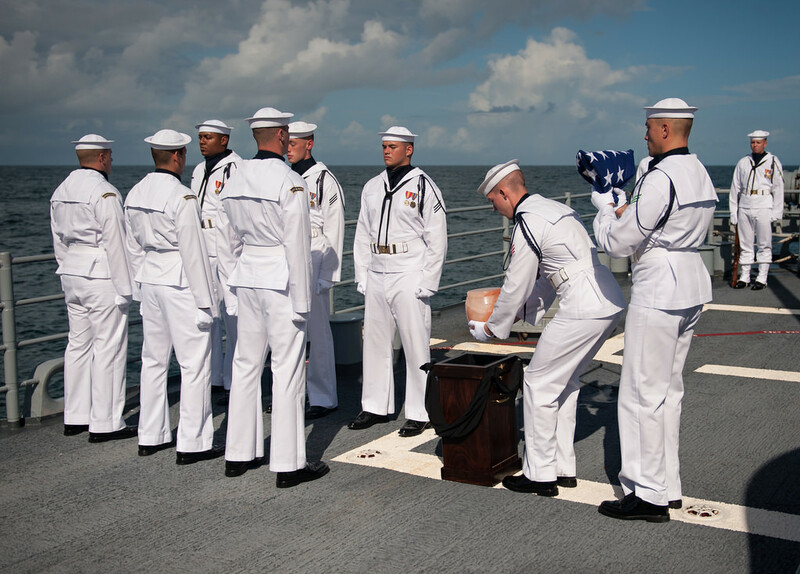 Earlier today, Friday, September 14, 2012, Neil A. Armstrong’s burial at sea service was held aboard the USS Philippine Sea (CG 58) in the Atlantic Ocean. 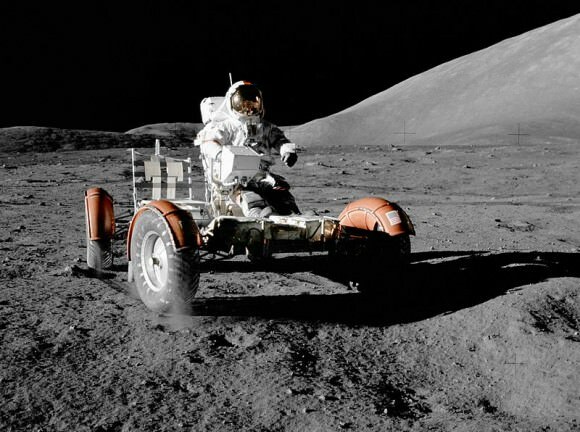 Armstrong, the first man to walk on the moon during the 1969 Apollo 11 mission, died Saturday, August 25. He was 82. An icon of exploration for all of humanity, he will be missed by millions and remembered forever. 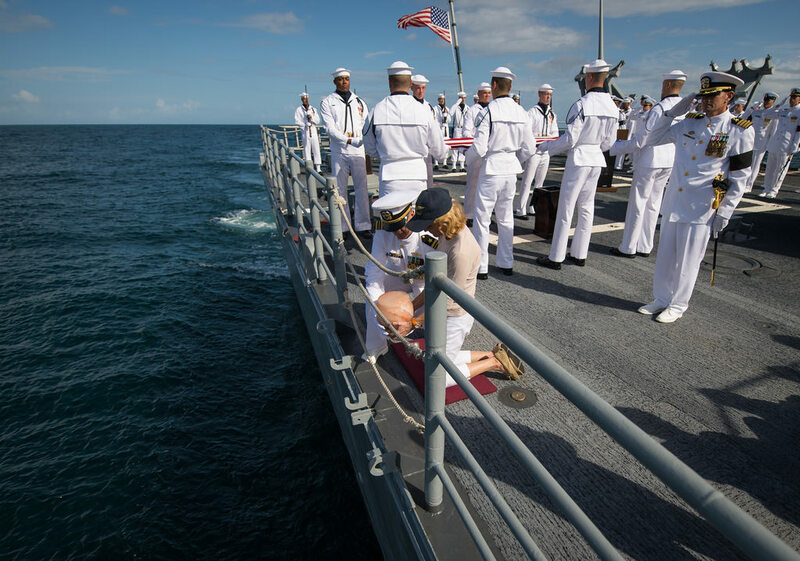 Godspeed, sir, and thank you. 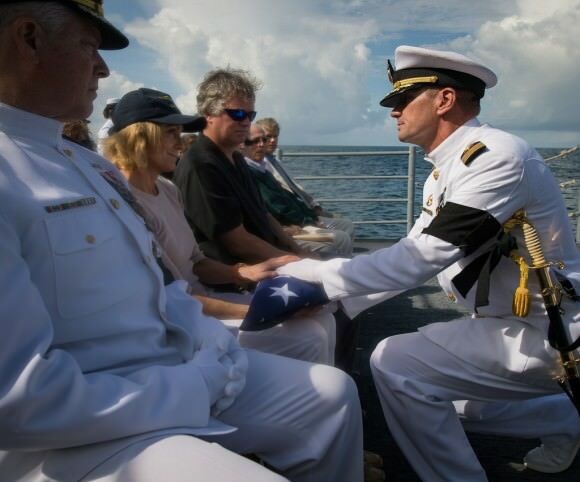 US Navy Captain Steve Shinego presents the US flag to Carol Armstrong as Neil’s son, Eric “Rick” Armstrong, looks on. 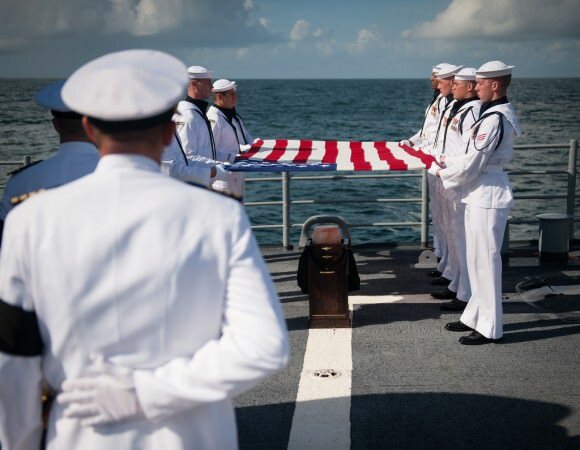 All photos credit NASA/Bill Ingalls. See more photos from the service on the Flickr set here. 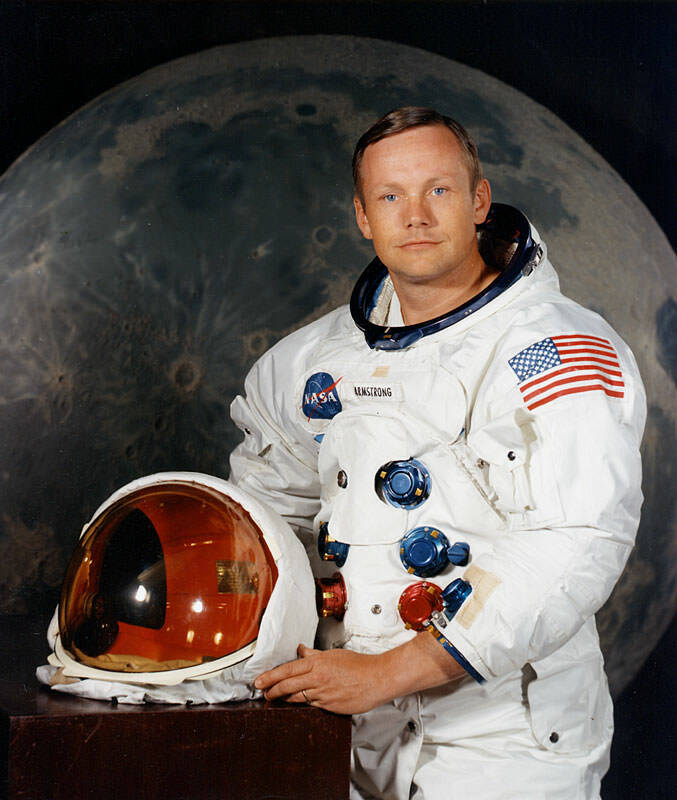 Neil Alden Armstrong, 1930 – 2012.